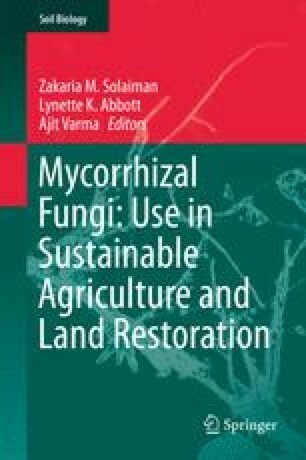 Arbuscular mycorrhizal (AM) fungi are ecologically important for most vascular plants for their growth and survival and act as obligate symbionts. At present, commercial AM fungal inocula are produced in nursery plots, containers with different substrates and plants, and aeroponic and hydroponic systems and in vitro. Different methodologies are required to recover and achieve continuous pure AM fungal inoculum without losing its potential. Most methods are cost-effective and valuable tools for production of inoculum at a large scale. Indeed, there are a number of entrepreneurs developing and marketing inocula of AM fungi, but there remain technical difficulties for commercial utilization. Furthermore, to avoid negligence, awareness should be raised in the public about the potential of mycorrhizal technology for sustainable plant production and soil conservation.